Something black, something white, something wooden, and something woven. I have come to realize that these are the four things that I, without fail, will put in every room. Those first three, they’re mostly decorative. But that last one, those baskets, they’re essential. Because you know what else I need in every room? I need it to look like nobody lives in there. These baskets are sparking me a lot of joy, because actually there’s a dog, a toddler, and a husband that are living here and they aren’t afraid to show it. I’ve never been really into makeup, so mine happens to all fit into one makeup bag. If you have a lot, you probably need a completely separate basket. That’s the beauty of baskets, you can never have too many! So my makeup bag is usually tossed on top. I keep lotions, deodorant, hair serum, and hair sprays all tossed in here. There’s also the electronics with the cords: hair dryer, curling iron, straightener. A couple of combs and brushes are tossed in here. I also like to keep a pair of scissors in this basket because I always seem to need them for odd reasons when I get ready, like cutting the tags off clothes or really bad hair knots. Hair ties and bobby pins are scattered around the bottom (Where do all of these guys disappear to?!). So here’s the beauty of this basket and the reason that it has worked for me for the 10 plus years I have used it: I take all of this junk out every morning to get myself ready for the day and make a huge mess! Then I just toss it all back in. A clean bathroom in seconds. We are not one of those take-your-shoes-off-at-the-front-door families. Sometimes I wish we were, because I spend a lot of time picking up shoes from random places in the house. Plus, there is the issue of remembering which random place you decided to take off your shoes when you are trying to leave in a hurry. This problem is 10X worse for kid’s shoes. They are always missing just one. So this basket is easy, I just toss all of the shoes into a basket by the door. I’m actually using a decorative tray for this right now. This one is fairly simple: mail, keys, spare change. It’s also a great place to keep all of those dog poop bags that no one really likes to be seen with, but no one likes to be caught without. Okay, so this basket is a little more decorative. I think my blanket basket is really pretty and I love to see the blankets all folded perfectly, just asking to be unfolded and tossed on the couch. 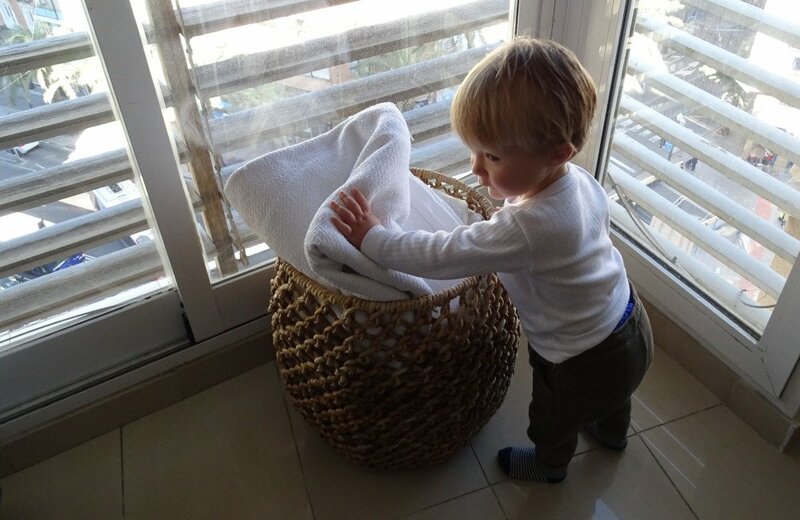 So here’s the little secret about the blanket basket: only the top one needs to be folded perfectly. The rest can be tossed in. This basket also keeps hidden junk at the bottom (i.e. exercise weights, cords, random dog toys). My list of baskets could go on and on: the baby bathroom basket, the nail polish basket, the junk drawer basket. I actually have at least ten more baskets in my house serving unique purposes. That’s not counting containers. Man do I need to contain myself.